Today is the day! We waited until after Easter, but I have been reading, researching, and planning and now feel very motivated. My son and daughter-in-law, Travis and Daphney, are on Day 29 today and have inspired us to try this, too. As part of my planning, I created a Whole30 Pinterest Board to help us through our journey. I had wanted to get all my ducks in a row before we started, but unfortunately life and the holiday got in the way. So, our first day started out with a pretty skimpy breakfast. Danny went to the grocery store for some items for lunch, and then we did a marathon shopping expedition in the afternoon for the rest of the week. One site I found to be extremely helpful in getting started was “The Clothes Make the Girl.” Melissa had a great plan for Week 1 and included a shopping list. I used this list and will be using her recipes this week. This will make Week 1 a pretty simple process for me. Disclaimer: Just to be clear, I am no cook. I have spent most of my adult life avoiding cooking. My oldest son once joked and told his school that he loved cafeteria food. It was the only hot meal a day he got. I am well-known for serving them, when they were little, bread in the toaster and pouring syrup over it and calling it french toast. Grilled cheese? Toaster again and then microwave some cheese on it. My youngest son was thrilled when I perfected making a French Silk pie for Thanksgiving. He told me he could now participate when everyone sat around and talked about things their mom made. Also, I’m no fancy photographer and some of my meals won’t be staged very well when I think to take a picture before I dig in, but I want to show you that even a poor cook can make some pretty delicious things when she has to. : ) Click on a thumbnail to see a larger view of each photo. Update: I’m finding I’m having fun cooking, too! And…..without even asking him to, Danny has been on dishwashing duty. That really makes the cooking more enjoyable. I did spend the morning cleaning out my pantry and will only keep Whole30 compliant items there for now. It is amazing how many outdated things I threw away. I also have several boxes of items for my other son and his wife. 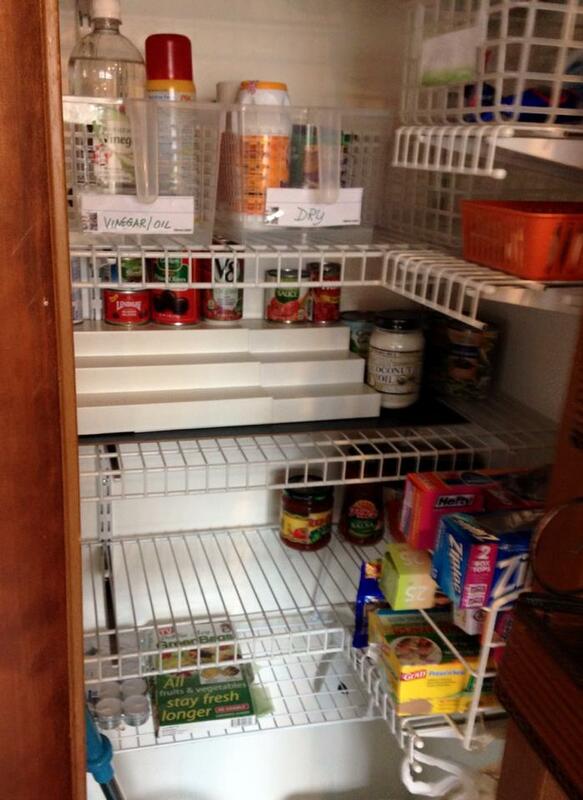 Anything they don’t want, they will give to the food pantry. Breakfast: As I mentioned earlier….skimpy….Two hard-boiled eggs and raspberries really wasn’t enough. We got pretty hungry by lunch. On the bright side, I found a great way to peel hard-boiled eggs. I plan on cooking some, peeling them, then storing them in water until needed this week. I learned online that I will want to change water each day. Lunch: I mixed up a big bowl of tuna fish and added a hard-boiled egg, celery, and grapes. I made Whole30 mayo and it was really good. I was pleasantly surprised. I loved this recipe. I will be making this again and again. We ate this with tomatoes and lettuce. This was really filling and we were fine until dinner. Dinner: After our marathon shopping, we knew we’d want a quick and easy dinner. So, we had fresh cooked shrimp, sautéed in olive oil with a little garlic paste added. I cooked spaghetti squash in the microwave, then added it to the shrimp and topped it off with a squeeze of fresh lemon and some basil flakes. We had green beans as a side. This, too, was very filling. After dinner, I cooked up two pounds of ground chicken and seasoned it for breakfast sausage. I divided that in half and we will have sausage for breakfast the next two days. Breakfast: Lesson Learned. Cook the scrambled eggs before adding the sausage. For some reason, the eggs kind of all cooked up in the sausage. I almost felt cheated. See, I warned you I’m no cook. I sautéed onion, yellow and red peppers, salt and pepper. I added the sausage to warm it up, then scrambled the eggs. It didn’t look very pretty, but it was good. I found a recipe I liked, but I’ll check around some more for one I like better the next time. I think I will go ahead and use ground pork instead of ground chicken or turkey the next time. The cantaloupe was very good. Lunch: Lunch has been my so far. Chocolate Chili! This was one of Melissa’s recipes and I must say it is the best chili I think I’ve ever eaten. I also spiralized zucchini and sautéed it in coconut oil with salt and pepper to taste. I have found I love cooking with coconut oil. It doesn’t get too hot and burn and evaporate and the flavor is unbelievably good. I could have eaten a ton of that zucchini had I not been full. Dinner: Here it is only Day 2 of our Whole30 and already we are going out to eat. This could prove to be a tough thing, but my husband and I have a standing weekly date for Tuesday Wing Night at Boomer’s, one of our local restaurants. We seldom get wings anymore, we just enjoy the company. Tonight was wonderful. We ate outside. I came prepared with my own salad dressing – a mix of Fresh Harvest Tuscan Herb Olive Oil and Fresh Harvest Basalmic Vinegar. I also brought my own cocktail sauce from a Whole30 recipe I found online. I used mustard powder instead of Dijon because mine had wine in it. I also left out the tabasco sauce. It was spicy enough without it. I literally could tell no difference between mine and store bought. We ordered a dinner salad with no cheese or croutons, boiled shrimp, and their grilled chicken topped with veggies. It was very good and we stayed on the plan. Yea for us! We should have had more veggies, though, as I was feeling pretty hungry later on tonight. I did have a handful of compliant mixed nuts and some blueberries to tide me over. Breakfast: Ahh…breakfast on the deck this morning. What could be better? Scrambled eggs and homemade sausage left over from yesterday, a glass of water with a little fresh orange squeezed in, my iPad, and hot apples. The apples? I washed but didn’t peel 2 apples and cut them up in bite size pieces. I put them in a microwave bowl and sprinkled cinnamon over them. Then I added 2 teaspoons of ghee and a Tablespoon of Coconut Oil. I sprinkled a handful of raw, unsweetened almonds over them and cooked in the microwave until apples were soft, about 5 minutes. Very good if I do say so myself. Activity: Went to yoga for the first time in a long time. Making this a priority again. Lunch: Leftover chocolate chili with olives on top – even better the second day. Fresh fruit on the side. Dinner: Grass-fed hamburger patty, sweet potato and brussel sprouts. I had never had brussel sprouts, but roasted they aren’t too bad. Snack: handful of Whole30 approved mixed nuts and frozen blueberries. I love to eat them frozen. Frozen grapes are great, too! We are not having any symptoms of headache, crabbiness, or anything like that so far. Both of us didn’t sleep well last night for some reason, though. No matter – we seemed to have a ton of energy today. We got a good workout in the back yard this afternoon. We made a slight dent in it and got the pond going again. Can’t wait to see all the baby goldfish born over the winter. We both mentioned that our knees actually felt pretty good. Well, until Danny pulled his when we moved the BBQ grill. Breakfast: I had 3 hard-boiled eggs and fruit. Danny had scrambled eggs and fruit. We were full until lunch. We did a little cooking today. I put a pork roast in the crockpot using the recipe from Melissa’s site. It cooks on low for about 14 hours so we will have that tomorrow. It sure smelled good cooking all day. I also cooked 2 lbs of chicken thighs on the George Foreman. I divided them in half for two meals. We spiralized some zucchini and put extra in the fridge. I read it will keep in a covered glass container for about 4 or 5 days. We also chopped up a bunch of onion to keep on hand. Lunch: While we were doing all the cooking and chopping, I went ahead and fixed Chicken Pad Thai over zoodles. I found a Whole30 recipe and tweaked it a little and it was pretty good. After lunch we worked most of the afternoon in the backyard, raking leaves out of the pond area and back yard and moving some things to the curb for throw away day and moving some other items around. It was a good workout. Danny hit 10,000 steps and I had over 7,000 today. Snack: handful of Whole30 approved mixed nuts and frozen blueberries. Dinner: I used the rest of the chicken I cooked earlier and made chicken salad with grapes, and homemade mayo over a bed of lettuce and tomatoes and sprinkled with sliced almonds. We also had a spinach salad with raspberry basalmic dressing I made. Whew! Lots of cooking, but it really helps that Danny is doing clean up. Breakfast: Breakfast continues to be just so-so. Eggs are scrambled or hard-boiled and some fruit. I need to look for some more inspiring breakfasts. Lunch: When we started this, I got out my big, old George Foreman Lean, Mean, Fat Grilling Machine that I hadn’t used in a very long time. Since I have no need for a toaster right now, I put it away and used that valuable counter real estate for keeping George handy. So, now for lunch. I grilled burgers on one side and sauteed spiralized zucchini on the other. How handy is that! Then, I took some bottled Pace salsa (I read the label and it was ok) and added some pineapple chunks and fresh mango chunks. I topped it off with some long hamburger dill pickles and some olives and we had a lunch some people pay big bucks for. Dinner: I must have been pretty hungry because I ate dinner without taking a photo. : ) Remember that pork roast I cooked in the crockpot for 14 hours? We had it for dinner tonight. It sliced up perfectly so I just warmed some slices of it up, warmed up the juices I had saved while cooking it and opened up a can of green beans. There was enough for leftovers tomorrow. This was so good, I will definitely do this again. It was a nice, quick dinner after a long day working in the yard. Bonus: I hit 10,000 steps today with all that activity! This was the start of a very busy weekend. Breakfast: Hard boiled eggs and fruit. This is pretty much my standard breakfast….some type of egg and fruit. Occasionally, I will like an omelet with veggies, but mostly I can’t do vegetables for breakfast. I really need to find some Whole30 bacon or some pancetta. Lunch: Leftovers…..the roast pork was soooo good along with a salad. Dinner: Kids were home so I made a double batch of chocolate chili and grilled hamburgers and zoodles on George. We also had a big salad. Yea! We’ve made it a whole week! No ill effects. Some positive things: I can feel I’ve lost weight, no stomach problems, no acid reflux, lots of energy, exercising more, knee pain not as bad, so I’d say Week 1 is a success. Breakfast: Daphney fixed fried eggs in ghee…..hadn’t had that yet. Very, very good. I believe this is my favorite way to eat breakfast eggs now. Oh, and fruit. Can’t forget the fruit. Lunch: Leftovers! Gotta love them! I just want to say that the Circus was in town. We made it through with no snacking at the circus! Dinner: Yep, Still had leftovers.